The once unbeatable Band of the Hawk is smashed, and their former leader, Griffith, has made an unholy pact with the demon lords of the Godhand, sacrificing his former troops to resurrect his crippled body and ascend to stand in power beside these profane gods. The Invocation of Doom has unleashed a plague of unspeakable horrors upon the earth, and the first battle not only shatters the Hawks, but the hand of their champion, Guts, and the mind of their captain and Guts' lover, Casca. And while time may heal some of Guts' wounds, it will not heal his desire for vengeance. And his discovery of a gigantic, dragon-slaying sword might be just the ticket to deal out some king-sized payback! 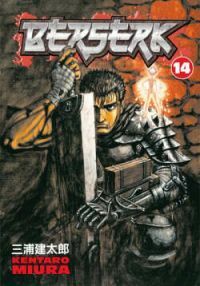 Also included in this volume: "Berserk Prototype," the very first Berserk story, created during Kentaro Miura's college days as his audition that sold the series!